We’re proud to introduce our latest design “Victoria”, 5 beautiful tiers of gorgeousness! Now, this is a cake to make a big statement at your wedding; “Victoria” will serve approximately 200 wedding guests so ideal if you’re having a super-duper wedding. 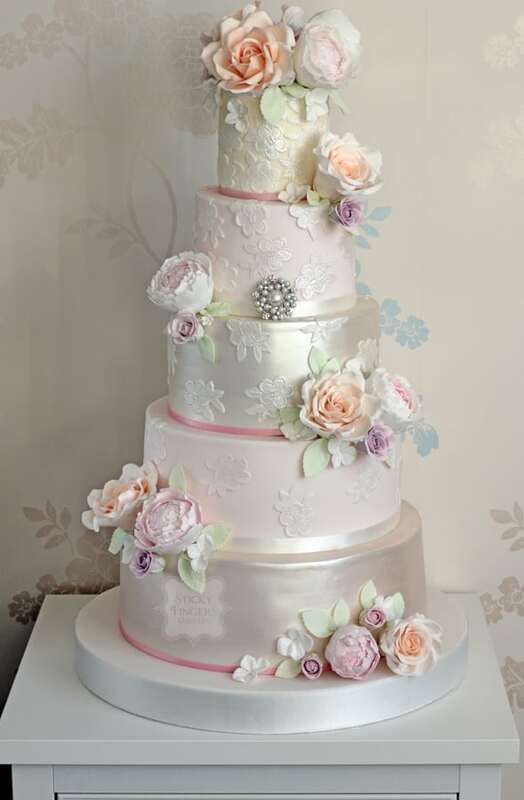 Adorned with pretty pastel coloured sugar flowers, edible lace and a vintage brooch, it really screams “vintage wedding cake! We can adapt her to fit in with the scheme of your wedding, whether that’s the flowers or the colours (or both!) We could even add some draping sugar pearls to really give it an extra vintage vibe. It’s up to you. So, what happens if you love this wedding cake but actually aren’t having 200+ guests? Simple; we can recreate Victoria using dummy tiers or we can just reduce the size to 3 or 4 tiers. If you’re interested in learning more about our new wedding cake design please get in touch at [email protected] or give us a a call and we’ll talk more about “Victoria”!